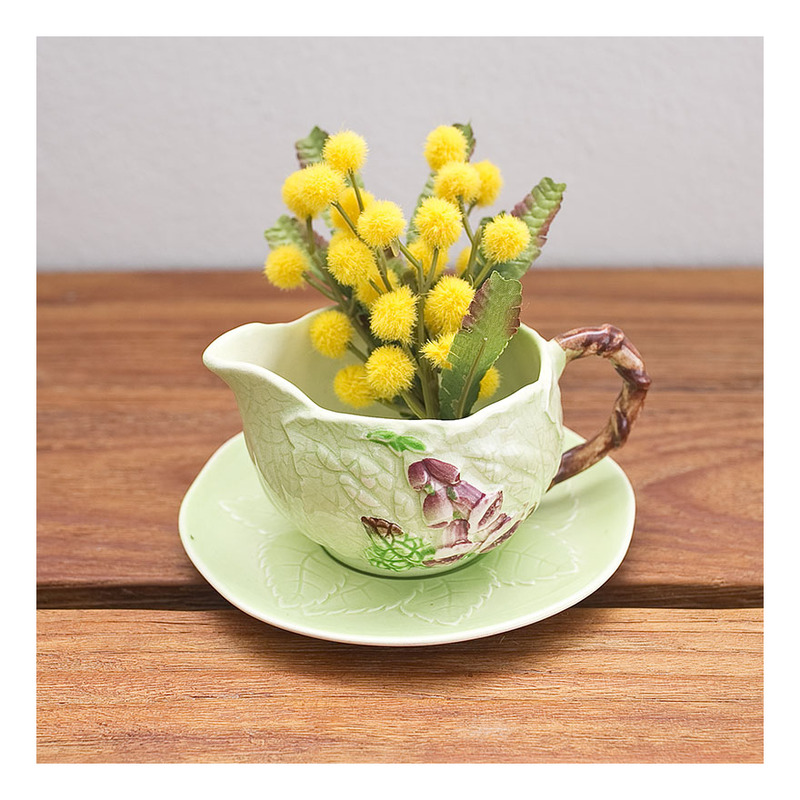 Many people are familiar with the botanically-themed Carlton Ware ceramics [and having a background in horticulture, I am quite ‘familiar’ with them myself.] Various daisy/foxglove/wild rose motifs were made in the 30s, 40s and continuing into the 50s, but in 1951 a modernist theme emerged. 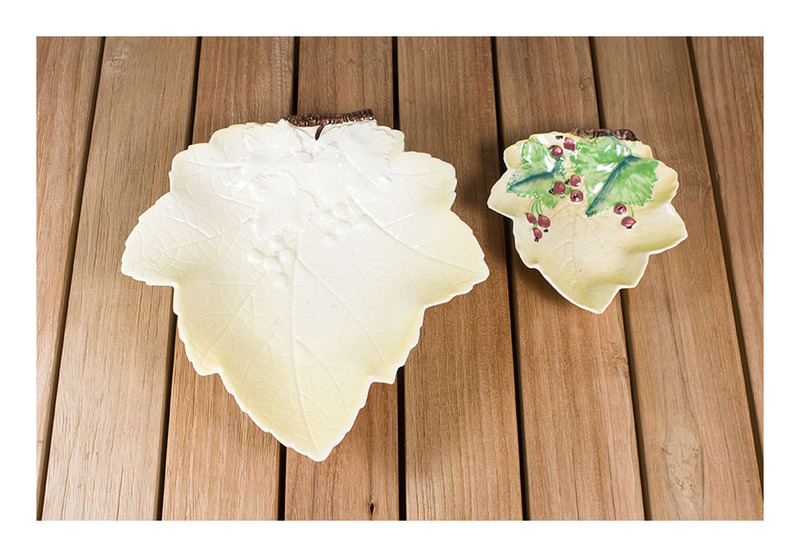 These leaf-shaped dishes and cubic salt and pepper shakers are an example of this and were dubbed ‘contemporary’ ware. The four monochrome dishes have a wonderful abstract leaf shape, and so appeal to me. I also like the austerity and the somewhat obtuse cube-shaped shakers. These pieces are now quite hard to come by, and are all in perfect condition. These are whiskey water jugs – and they are both practical and highly collectable. They are ‘advertisement’ jugs mass produced and given away to pubs –not sold to the public- with the idea that the public would be so impressed by the glamour of having water added to their drink by a ‘branded jug’ that they would continue to order their brandy/whisky by name. Ah! the70s, when advertising and impressing people was so easy! The White Horse Scotch Whiskey jug was made by Wade; the Haig Scotch Whiskey jug was made by Carlton Ware- and has a beautiful integral handle and fantastic 70s square-shaped styling. The last jug is now quite rare: a Marie Brizard Liquers de France, made by Digoin – with a fabulous pouring spout. 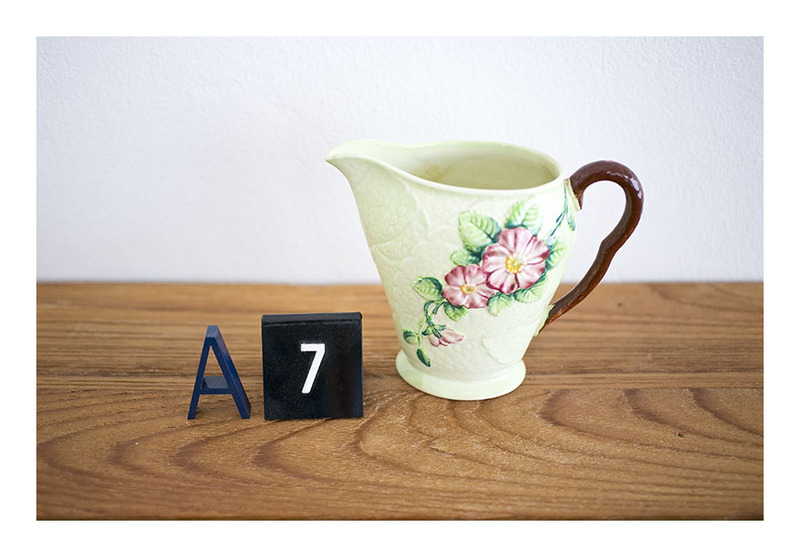 All jugs are in fantastic vintage condition- with the slight exception of the Marie Brizard, which has some wear to the print on the reverse of the jug. I also have some 60s whiskey jugs: a Rene Briand Brandy jug marked ‘Ceramica E. Piloa, Carpignano S.’ and a McCallum’s jug with the usual Wade branding. You really can’t have too many whiskey jugs! These jugs are for sale: $AUD45 each. This scotch whiskey water jug is both practical and collectible. It’s an ‘advertisement’ jug; these mass produced jugs were given away to pubs in the 50s and 60s –not sold to the public. The idea being that the public would be so impressed by the glamour of having water added to their drink by a ‘branded jug’ that they would continue to order their brandy/whiskey by name. Ah! the 60s, when advertising and impressing people was so easy! The jug- being made by Carlton Ware- has a beautiful integral handle [not quite seen in image] and fantastic 60s square-shaped styling. It is very modern in form – and in fantastic condition. Makes a great vase, too. In my collection I also have a Rene Briand Brandy water jug, made in Italy, and a McCallum’s Perfection Scots Whiskey water jug, made by Wade, England – both also in the 60s. These water jugs are adding up! They make a fantastic addition to the retro bar. The four monochrome dishes have a wonderful abstract leaf shape, and so appeal to me. I also like the austerity and the somewhat obtuse cube-shaped S & P shakers. These pieces are now quite hard to come by, and are all in perfect condition. Did I mention, once or twice, that I am drawn to botanical themes? That I might have collected a bit of it due to being a landscape architect? Well- here’s proof positive. A beautiful Carlton Ware ‘Wild Rose’ jug- # 1696 [#16 for the green background, and #96 for the jug] – in great condition with nary a scratch or a nick. The rest of the malarkey in the image is my fondness for ‘styling’…but I do like to mix vintage pieces with contemporary, in a new context. Because these retro pieces have to find a new way of being in the contemporary home…and this is how I do it. You might do it differently…and if so, I would love to see how/why. It would be great if you sent me an image of how you incorporate these pieces into your life. I have written about Carlton Ware ‘salad ware’ previously – I love all the botanical specimens featured in this series- they all have embossed, hand-painted flower patterns. This sauce boat has a green ground- it also came in yellow and peach- and it has a matching green saucer with embossed leaves. The foxglove sauce boat is pattern number 1897. I’ve teamed the sauce boat with some wattle flowers- a bit of a mixed-metaphor botanically speaking, but pleasing to look at none-the-less. The sauce boat can be used – as a sauce boat- or a jug or – more interestingly- as an impromptu vase. ‘Redcurrant’ was also part of Carlton Ware’s Salad Ware series. The smaller, hand painted plate [yellow ground decorated with embossed red currants, brown ‘tree branch’ handle, stamped # 1637] was made in the thirties, whilst the larger, unpainted plate [except, curiously, the branch handle]- was produced during the war. The whole range of Carlton Ware embossed floral plates is thus – if it is unpainted, it was produced during the war years. The Redcurrant series though was produced right up until the early 60s. I may have mentioned before that I am drawn to botanical themes- and that I may have amassed a fair bit of botanical related items due to being a landscape architect. Well- here’s more proof. A collection of ‘Apple Blossom’ in the two colours in which it was produced- yellow and green. 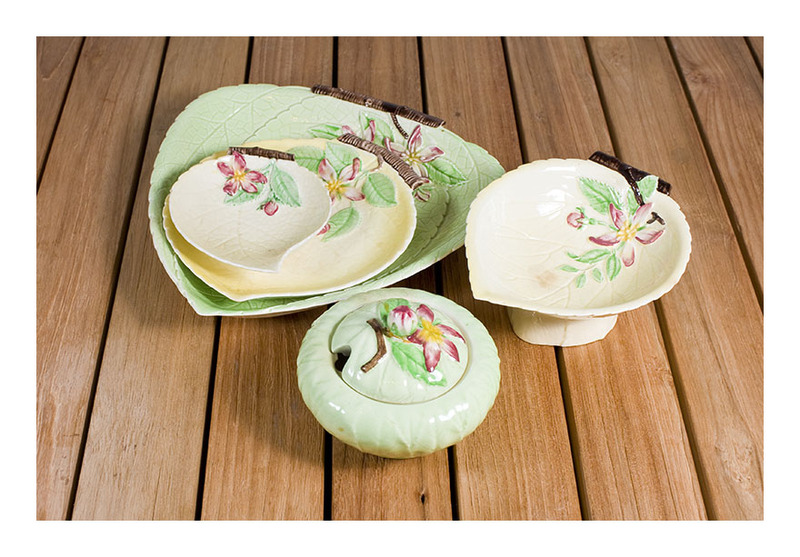 The floral embossed motif ‘Apple Blossom’ was part of Carlton Ware’s Salad Ware Range, produced from 1937 to the 1950s. Apple Blossom was the most popular of the floral ware produced and over sixty different items were made : seen here are a large, medium and small plate, a footed bow and a sugar bowl. Carlton Ware is very collectible – you may have seen my previous post of the Wild Rose jug [also part of the Salad Ware range]- but like all collectibles its popularity waxes and wanes. Us purists, of course, collect what we like and are unswayed by popularity. And I like botanical themes on my pottery!